Deniz Maravent was in luck when she walked into a McDonald’s for her morning coffee and saw half a dozen police officers chatting with patrons. Constable Sean Forrest shares a laugh with Elvis Okereke and his mother Sandra Onwumere. The mother of two had been thinking of applying to be a police officer, but knew little on the process to apply or even what the job was like, having moved to Canada just five years ago. 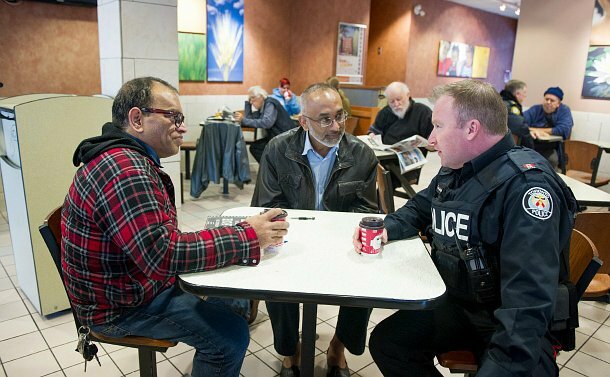 “I had been talking to my friend about applying and I walked in this morning and saw all these officers!” said Maravent, who had walked into the Coffee with a Cop event organized by Constable Mark McCabe. The event is the second one organized by 41 Division, to allow residents to interact with officers in a friendly environment and have any questions answered. “It’s great because we are bringing the community together. When they come in here and see us, first they are not sure that they should come in and talk to us. 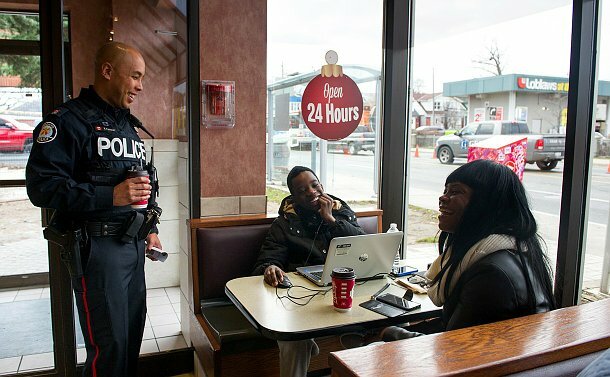 Once we approach them, and tell them why we are here and that our purpose is to sit down and have a coffee with them, they can talk to us one-on-one on all their issues and concerns,” said Constable Tara Stedman-Smith, who had a long conversation with Maravent on the police application process. McCabe said that he wanted to ensure everyone has a chance to chat with police in a comfortable forum. He realized the value of that after doing some crime prevention presentations and community meetings and realizing that some people are too nervous to get up in front of an audience and ask questions. “When we are at a presentation or a meeting, they don’t want to stand up in front of everyone and ask a question, they don’t want to call 9-1-1 and maybe are too intimidated to go into a police station and ask a question. So, this way, we are coming out to them and meeting them in a neutral area, like we say, no agendas, no presentations, we are just here to communicate and get the communication going,” said McCabe. Deniz Maravent speaks to Constable Tara Stedman-Smith at a Coffee with a Cop event with Staff Sergeant Deb Houston. The first Coffee with a Cop was held in November and was a big success, which is why McCabe held a second one this month and hopes to get it in a different part of the Division for every month of the year. Some people come in with prepared questions because they see flyers or social media posts, said McCabe, others just happen to be there and end up chatting with the officers. Conversations have ranged from parking issues, to tenant and landlord problems, to enrolling children in the Youth In Policing Initiative and even Star Wars. Okereke said he’s used to seeing officers in his school. “I am kind of already used to it, because in my school we have an officer that we talk to every day. At lunch time, he opens the gym for us to play basketball during lunchtime, so he is normally there and so I am used to it like that,” he said, after speaking to Constable Sean Forrest on his passion for music and mixing his own beats after school. “He was telling me that I should focus on school and become what I want to be,” said Okereke. Other than answer community questions, officers also inform people about how to stay safe. Stedman-Smith said she hopes the brief conversations over coffee result in a greater comfort level in the future. “Ultimately we want to be here, so that when are out on the streets, people have no problem approaching us with any of their questions and concerns and we are able to help them,” she said. Constable Mark McCabe hands a sticker to two-year-old Rapheal Neito who was there with his grandfather.